Not sure which software best suits your business, no problems. The page below outlines all our software and which type of business they are best suited to. Have a enquiry? Please give us a call or send us an email, we will be happy to answer any question you have about WoodCAM and explain in further detail how it will help you save time and improve productivity of your business. Check out our quick overview video above of how WoodCAM will help streamline your cabinetry business. WoodCAM (Woodworking Computer Aided Manufacturing) is a design and manufacturing computer software package for cabinet makers and joiners. It has been created to streamline the entry of cabinet specifications and does this by presenting a selection of cabinet styles for each job and room from a library of standard joinery product templates. The operator enters dimensions, door and drawer specifications including handle type and location, shelf configurations, applied end panels, etc. Reports are produced including cut lists, costing analyses, hardware requirements and labels to affix to the cut parts. WoodCAM was designed in Australia by Gary Cannard who has had over 25 years experience in the cabinet making and software industries. Gary started his career with the manual design, measuring and cutting of cabinet parts. He has used several computer based cabinet design programs with varying success and reached the point where he could not achieve the level of detail he required with modern design ideas. Gary developed his own excel spreadsheets to include the details he required and in conjunction with another programmer, who has a life long background in the design of software packages for businesses, they implemented the system into other joineries on a trial basis. This Has been so successful that it is now being offered to the wider marketplace. WoodCAM is designed to save you time. To start with, it is incredibly easy to enter a new cabinetry job using this versatile CAD/CAM software. From simple jobs to the most complex, WoodCAM has an intuitive, step-by-step process that any person who understands the trade can use. What’s more, all dimensions and drilled holes are automatically generated – so you don’t have to calculate part sizes yourself. WoodCAM has been developed to make the entry of designs and specifications into Microsoft Excel spreadsheet templates easier and to automate the processing of your designs to create a cut list to be sent to the machine for cutting. Wherever possible, WoodCAM reduces any need to re-enter the same information for each cabinet in a room. Top Section: The job details are entered into this section and include the customer order and delivery information. These details are entered only once and remain on screen for reference during all other entry. Middle Section: The room details are entered including the room style and materials used. These details are entered only once for each new room and remain on screen for reference during Item entry. Bottom Section: The cabinet item details are entered including dimensions, fittings and accessory options. Note: Once entered the details can be exported to a panel viewer screen to show bore details, hinge locations, edging details, etc before you cut the job thus preventing mistakes and wastage. A key benefit of WoodCAM is the accuracy with which it generates quotes. It produces job costings with every screw, hinge, metre of edge tape and board accounted for – so you know exactly what it will cost your business, and don’t experience the cost blow-outs typical of manually calculated jobs. 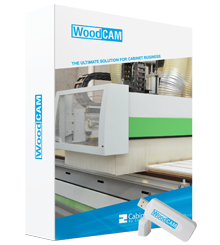 WoodCam has been created to streamline the entry of cabinet specifications and to automate the distribution of cutting lists to CNC machines such as Flatbed Routers and Saws. Input the the job and WoodCAM quickly procures an accurate cutting list down to the millimetre. Produce job costing reports with the click of your mouse; or drill into more detail by specifying your own hardware, materials and manufacturing costs. Add your margins to the job and generate a detailed quotation for your customer with the touch of a button. Monitor quantities of stock on hand and automatically reorder products that are running low. Items to be ordered are sorted into suppliers and an individual purchase order is generated. Produce a variety of reports that are useful for the everyday running of your business. Things like cutting lists, outsourced products (e.g. vinyl or painted doors), picking lists for hardware or a history of your customers. Networked computers can be set up to access a centralised database, and any changes made to a job will be automatically detected, updated across the system and backed up daily. Create templates using default settings for cabinets you use on a regular basis. This further reduces the amount of time it takes to create new jobs, and allows you to use any previous room as a starting point when entering a new room. Trace all components as they progress through the factory until delivery. This feature accurately calculates the time required for each stage of the job, which enables you to keep track of the efficiency of the job as it passes through your workshop. WoodCAM comes with a built-in library of the most common cabinet maker items, saving you time and money on entering these items into your system. These spreadsheets provide a parts list of all materials and accessories which may be used as a ‘Packing List’ for assembly / delivery. WoodCAM is guaranteed to work with all brands and models of CNC machines and computer saws, and automatically generates cutting lists for these machines.